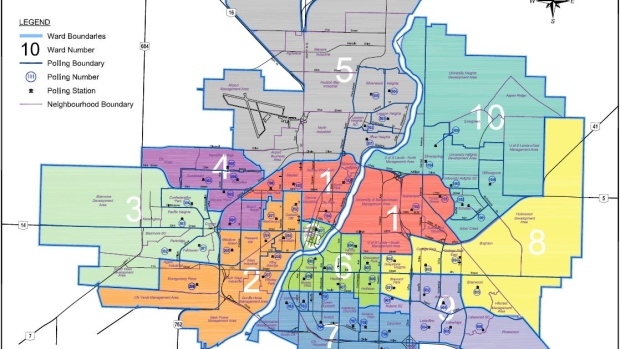 The City of Saskatoon plans to redraw its 10 ward boundaries ahead of the 2020 civic election. The city aims to have each ward consist of about 10 per cent of the population; Ward 7 and Ward 10 are over that threshold, while Ward 5 and Ward 8 are under, according to 2018 Saskatchewan health card population data. At Monday’s governance and priorities meeting at City Hall, councillors and the mayor reviewed an administration report calling for a review of the boundaries. Boundaries were last reviewed in December 2015 and redrawn in February 2016 ahead of the fall civic election. According to census data, Saskatoon’s population hovered around 245,900 in 2016. For 2018, city planning and development staff project the population to have grown to 270,794. The city has received permission from the Ministry of Government Relations to adjust boundaries based on health card data. The Municipal Ward commission will undertake the process which includes a public consultation to clarify constituents’ questions.